Service on MARC’s Brunswick Line continued to be cut back Friday, as infrastructure problems did not let up and the continuing rain may have in fact made matters worse. 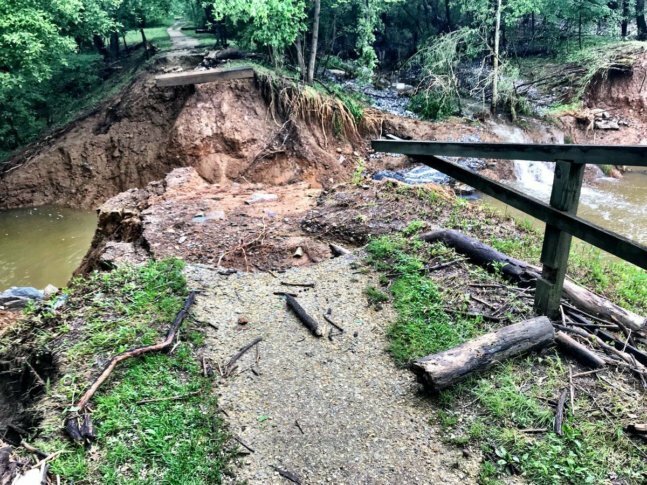 WASHINGTON — MARC said on Thursday that work continues on the track problems west of Port of Rocks – particularly the track washout between Point of Rocks and Brunswick – and that a mudslide west of Brunswick has added to the problems. Four of the nine trains on the line are stuck at either Brunswick or Martinsburg. “Additional infrastructure problems are likely given tomorrow’s forecast for even more intense rain,” MARC said in the statement. There will be no Brunswick Line service at Martinsburg, Duffields, Harpers Ferry, or Brunswick stations. There will be limited service at Point of Rocks. For further news, be sure to monitor train status updates at the Maryland Department of Transportation’s MARC website and through its Twitter feed. Train 871 (Friday-only 1:30 p.m. departure from Union Station) will not operate. Train 873 (3:30 p.m. departure from Union Station) will not operate. Train 891 (3:45 p.m. departure from Union Station) will add stops at Kensington, Barnesville and Point of Rocks. Train 877 (4:55 p.m. departure from Union Station) will not serve Brunswick station; after departing Point of Rocks it will operate to Monocacy and Frederick. Train 893 (5:20 p.m. departure from Union Station) will not operate. Train 879 (5:40 p.m. departure from Union Station) will operate as scheduled Washington to Point of Rocks, then continue on to Monocacy and terminate at Frederick. Train 881 (6:20 p.m. departure from Union Station) will operate as scheduled Washington to Point of Rocks, then continue on to Monocacy and terminate at Frederick. Train 895 (6:40 p.m. departure from Union Station) will not operate. Train 883 (7:25 p.m. departure from Union Station) will not serve Brunswick station; after departing Point of Rocks, it will operate to Monocacy and Frederick. MARC also said that trains will be smaller – most of the trains stranded at Brunswick and Martinsburg are the larger five- to six-car trains. Passengers from Martinsburg should consider using Commuter Bus Route 505 from Hagerstown; Frederick County passengers should consider Commuter Bus Route 515 from downtown Frederick and Monocacy, MARC said. The Metro option will also be open. MARC will make an announcement about Monday service by Sunday evening at the latest, they said. On Tuesday night, more than 80 people were trapped aboard a MARC train during the flash floods that hit Frederick County. The passengers, who were headed to the Brunswick station, were told they needed to go to the upper deck of their double-decker train to stay safe.